Hanging our clothes is something that we may give little thought to, but as Space Age Closets, the leading provider of custom closet organizers and designers in Mississauga, tells their clients, properly hanging clothing and using the proper type of hanger can have an effect on the shape of your clothing and how long it lasts. You want your clothes to last as long as possible, and something as simple as using the proper technique to hang your clothing can greatly extend the life of your clothes. As the top provider of custom closet organizers and designers in Mississauga, we have a few tips for our customers so they can make their clothing last for years. For most men, their suits are some of the most important, not to mention costly, items in their wardrobe, making hanging them properly important. The hanger for your suits and tuxedos should be sturdy and able to support the weight of both the pants and jacket, as well as hold the same shape as though it was on your shoulders. When it comes to hangers, most people use simple plastic or wire hangers because they’re free. However, if you want your clothing to last, we recommend buying sturdy wood and padded hangers to maintain the shape of your clothing. If you have a large wardrobe but don’t have a lot of space, adding double rods can add considerably more space to your closet. As the leading provider of custom closet organizers and designers in Mississauga and Peel Region, we will add double rods to closets, creating more space for your extensive wardrobe. It is recommended that you should let dry cleaning hang outside of your closet for a short time before you put it away. A valet hook is an easy way to do this; it can also be used to arrange clothing you are packing for a vacation or to organize your wardrobe for the day. Our custom closet organizers are also an excellent way to store items in your closet so you’ll never have to rummage through your closet to find your purse. If you have more than one belt, a hanger with hooks is a good way to organize them and avoid having them end up on the floor, not to mention will make them easier to find. Our closet organizers can also provide excellent storage for your jewellery, rather than a box on top of a dresser. Having a shoe organizer in your closet can also save on space in your front hall and under your bed, just make sure you clean the bottoms of your shoes before you put them in the closet and put down paper towels to soak up moisture and catch dirt. You can also put shoe racks on the back of your closet door, or if you prefer to keep your shoes on the floor, a shoe platform is another option. As the top provider of custom closet organizers and designers in Mississauga, we offer a number of storage options for anyone with an extensive shoe collection. We also provide our customers with clear storage bins so you can easily see any item of clothing or accessory. 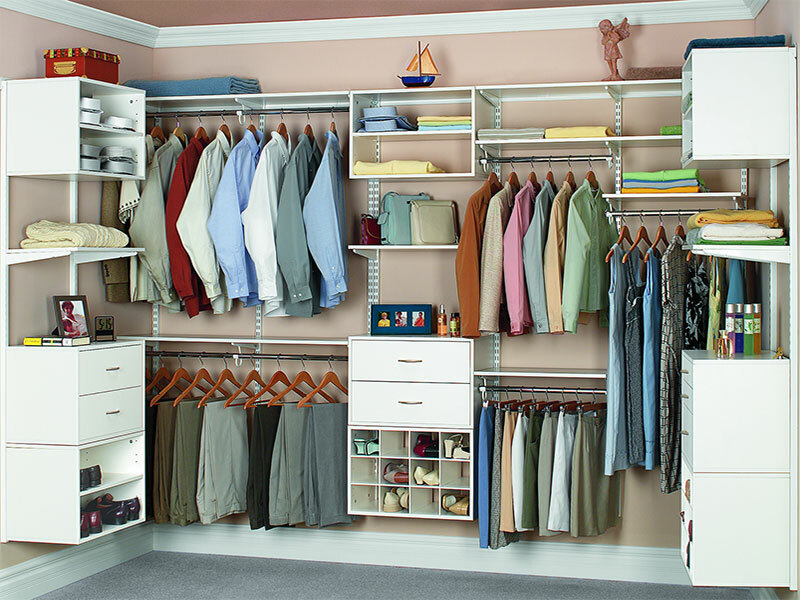 Regardless of what you are looking for, visit Space Age Closets for the best custom closet organizers and designers in Mississauga and Peel Region!